Hi. Just got my G6 Platinum. I noticed there is a stock screen protector on there out of the box. Does anyone know if this is a tempered glass screen protector? It seems thicker then a film protector. And to the ones that have it, are you taking it off and putting a new tempered glass on one? I would like a tempered glass protector, but if the stock one is gives good protection, I may just leave it. The protective film from shipping is not a screen protector. Nor is it meant to function as one. Is is there simply so that the screen isn't damaged in transit. Hence why it has that nice quick pull tab at the top. Remove it, and go buy a real one. Mine totally came off when I pulled it out of my pocket. Haha.. I bought a tempered glass one. That is weird. The one I have on looks like a real screen protector. From this picture you can see it, especially near the LED, camera and ear piece, where it doesn't cover it. Do you guys not have this? It isn't a cheap piece of film. It feels like a real protector but maybe not tempered glass. My friend has the same thing when he got a black one too. Yeah that's the same one I had.. But the tab got caught on part of my jeans and peeled halfway off.. Which, you know, once that happens it basically doesn't work anymore. Ah okay. It seems like a pretty sturdy protector. I will just keep it on there for now and when it comes off, I will put a new one on. Thanks everyone for their input. actually, now that I see it on my computer, I don't see the tab on there.. That might actually be a screen protector.. Which carrier? Yeah. There is no tab attached to it. That is why it puzzled me on why it was on there. It looks real and feels sort of thick compare to the cheap plastic bag type film they put on new phones. I am in Canada and got it from Fido. Also, I noticed my friend with the black version has some sort of protector on the back of the phone similar to the one in the front in the picture, but I do not have it. Not sure which carrier he got it from. I assume none of you had the back protector either. I do not, but I rock a thin case so it's ok. Enjoy having that free screen protector though. Bonus. haha. But now this has got me thinking this was a return they sold me. oh well. it works great. no issues. love this phone for the price i got it for. Wasnt going to say it but since you did thats exactly what Id bet it was. Not sure if Canada has the Google Home promotion but if you do have you submitted the registration for it to make sure someone didnt already submit that imei number to get the free gift? I will try to register it. I was wondering, do you know to find the lifetime use of the phone, like call time, or even when it was first turned on or activated? It will bother me a bit until the new phone phase wears off, haha. There is no issues with the phone so far. I guess for me, if I buy new, I expect brand new. I was excited to get the phone on a deal and it was lunch time, so a bit rushed, so didn't notice. Just check for google home promotions. nothing up here in canada. all we have is free download of games worth $200. Funny trying to register on the LG canada site, it doesn't even have the G6 model number lists. LOL. Its actually a perfectly applied plastic film screen protector. Its not glass. But should afford you some protection till you get the Nilkin screen protector. Replace it if you want better quality selfies. As the cutout actually causes edge reflective glare. Your texting sensitivity via the glass protector would be better as well. they come pre installed. it's a proper film protector not temporary. Hi, I had plastic screen protector on mine with a tab. And under that a second screen protector like yours. I put a glass screen protector over it before noticing. Did you end up removing the screen protector/film? 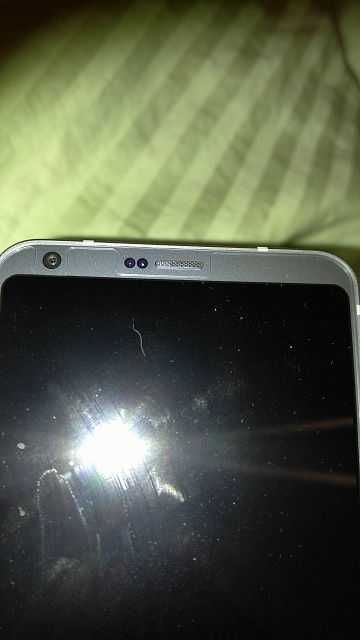 I've used my G6 platinum for about a year and a half with it and like to remove it, but I'm not sure if it'll come off without leaving any marks on the screen.